The 'License Manager' is used to add and remove QuantaStor licenses. QuantaStor has two different types of license keys, 'System' licenses and 'Support' licenses. The 'System' license controls the feature set and capacity limits. Enterprise and Trial Edition licenses have all features enabled, and Community Edition licenses impose some feature limits. Active QuantaStor license subscriptions are transferable to new hardware, and licenses with a 3+ year term are non-expiring. Trial Edition licenses are fully featured like Enterprise Edition, but are time limited. To replace an old license key, you will need to add a new license key, and then it will replace the old one automatically. The 'Recovery Manager' is used to recover the internal configuration database from a backup. This is useful if a QuantaStor system is re-installed, and you need to recover the previous configuration data for Storage Volumes, Network Shares, Users, Hosts, etc. In grid configurations, the 'Recovery Manager' is less important as the configuration data is replicated across all nodes. 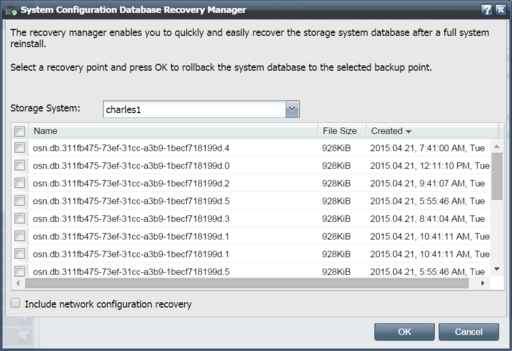 To use the 'Recovery Manager', select it then select the database you wish to recover, and then press OK. The databases are backed up onto all the storage pools hourly, and the list of available databases is taken from those discovered on the started Storage Pools. If you choose the 'network configuration recovery' option, it will also recover the network configuration. IMPORTANT NOTE - Be careful with IP address changes, as it is possible to affect your current connection to QuantaStor, as it is dropped when the IP address changes. In some cases it is better to use the console to make adjustments, if all network ports are inaccessible due to no configuration or mis-configuration. When a QuantaStor system is first installed, it will default to using DHCP on an interface. If a DHCP server is available, it will assign an automatic IP to provide initial access to the system, and then static IPs can be assigned. Please use caution when recovering an internal DB, which might be a backup from another server, as that could lead to having two servers with the same unique ID (UUID). If you are having issues, or you would like to ask a question regarding the 'Recovery Manager', we recommend contacting support (support@osnexus.com) for assistance in restoring a database. 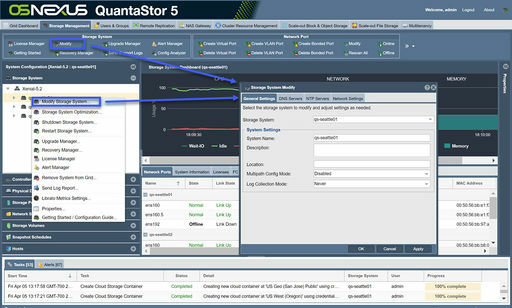 The 'Upgrade Manager' is used to upgrade your QuantaStor appliance to the next available minor release. The 'Upgrade Manager' does not currently handle upgrading major versions, and if you wish to upgrade to the next available major release, you will need follow the official upgrade steps provided in the QuantaStor Version Changelog. 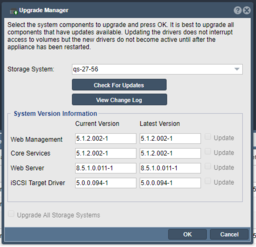 The 'Upgrade Manager' displays available versions for key packages including 'Web Management', 'Core Services', 'Web Server', and the 'iSCSI Target Driver'. You can upgrade the packages at any time, and it will not affect file, block, or object storage access to your appliances. Restarting an appliance that has an active HA pool, will automatically fail-over to its associated cluster pair appliance. It is recommended to manually fail-over pools to the paired appliance before rebooting, as this will cause the fail-over to be a few seconds faster. IMPORTANT NOTE - Upgrades of the 'iSCSI Target Driver' package will require a reboot to activate the new drivers. It is also recommended to always upgrade all packages together, and to never upgrade just the 'Web Management' or 'Web Server' package, as this may cause problems when trying to log in to the QuantaStor web management interface. On rare occasions you may run into problems upgrading, and if this is the case please review the Troubleshooting Upgrade Issues section. The 'Getting Started' button, aka 'Workflow Manager' will appear automatically when you log in, and when there are no license keys detected. Once a license has been added, the 'Getting Started' dialog is available at in the 'Storage System' section in the ribbon-bar. 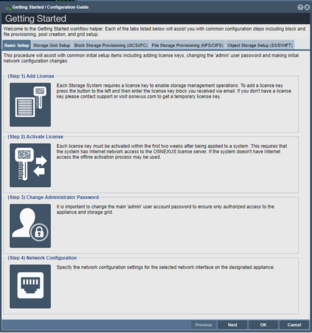 The 'Getting Started' screen provides step-by-step instructions for common operations, including network configurations, storage volume provisioning, network share provisioning, object storage setup, and more. This area is to help get you acquainted with QuantaStor. To change the name of your system, you can right-click on the Storage System in the tree stack on the left pane and then choose Modify Storage System.... Alternatively, you can select Modify from 'Storage System' in the toolbar. This will bring up a screen where you can specify your DNS server(s), change the hostname for your system, as well as control other global network settings like the ARP Filtering policy. This page was last modified on 10 April 2019, at 18:21.